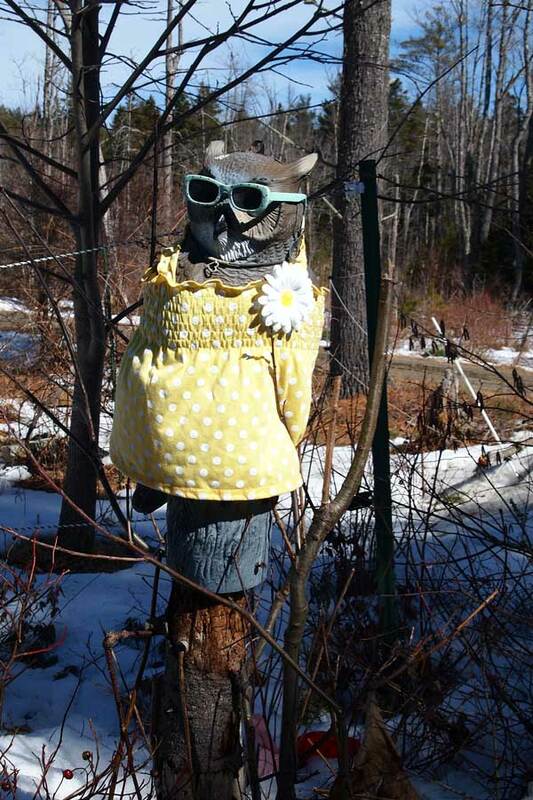 Someone on our muddy, rutted road donated a yellow gingham dress and sunglasses to the SCOwl today. To all our friends in Boston and Points South – you may have a foot of snow in the backyard, but the owl has declared the start of spring! This entry was posted in Maine, the neighborhood and tagged Bar Harbor, social capital owl, spring on March 9, 2013 by APo. That is one of the better looking outfits the owl has worn in many years. Glad to see tradition continues. You should totally have one at the end of your drive! Think of the fun of making costumes. . just about the same size as an 18″ doll, and some of the more successful and long-lasting entries in the Dress The Owl Sweepstakes have been small-dog outfits. Lots of patterns out there for those.